Just days after their return to the country, the bells of Balangiga are ringing a new controversy, this time between a senator and the Diocese of Borongan in Eastern Samar where the bells originated more than 100 years ago. Church leaders said it would be “disrespectful” to keep any of the three bells outside Balangiga town in Eastern Samar, where they belong. Senate Majority Leader Juan Miguel Zubiri, who filed a resolution asking to display one of the bells in the National Museum, said the clergy were being “arrogant” in their statement. The bells were taken by American troops as war trophies in retaliation against the people of Balangiga for the Sept. 28, 1901, attack on a US Army garrison in the town that killed 48 soldiers. One of the bells was used to signal the attack, according to historian Rolando Borrinaga. 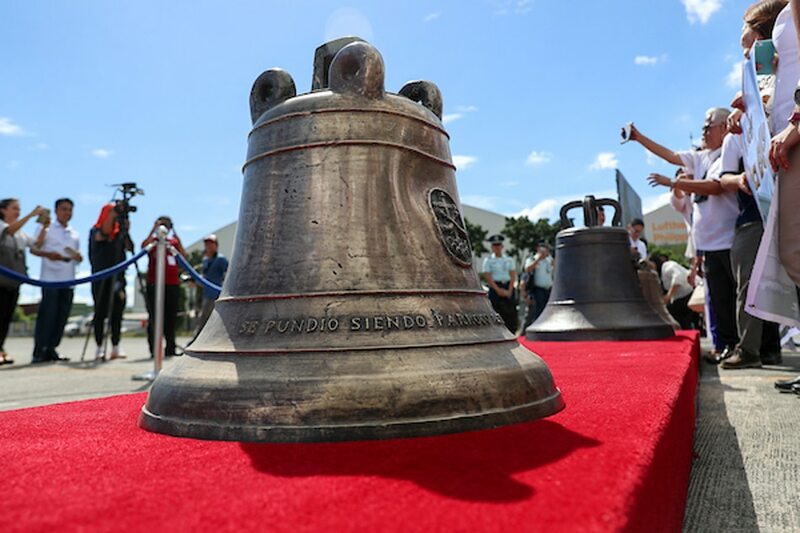 US officials formally handed over the three bells to the Philippines on Tuesday upon their arrival in Manila. The bells would be brought back to Balangiga in ceremonies to be attended by President Duterte on Saturday. It would also make the bell “accessible to the countless students who make school-sanctioned visits to the National Museum every year, providing them an opportunity to learn from the struggles of our forefathers through the study of this historically significant property,” he said. “Any effort aimed at such a transfer is a disrespectful mangling of history and the right of the Catholic faithful of Balangiga to their private property,” they said. Zubiri’s proposal “does violence to history and the sacred character and purpose of the Balangiga bells” and “must be rejected,” it said. The Senate leader said he respected the Church leaders’ position but questioned their attitude. “If they don’t agree, then so be it. But how arrogant are they to say that this is disrespecting the history of our country?” he told reporters.